The purpose of this column is not to attempt to make picks, but to highlight a few things from every game that I am going to be paying attention to and think will factor in to the game’s outcome. But first, let’s start with a recap of last night’s game in Foxboro. Patriots/Texans (RECAP): The Patriots showed again why they are the best team in the NFL with a dominating win on Thursday Night Football. No Brady? No problem. No Jimmy G? No problem. Jacoby Brissett looked fantastic for us; is there anyone besides Bill Belichick that starting a 3rd string quarterback wouldn’t be an unmitigated disaster for? Seriously, I expected to win this game as a Patriots fan, regardless of who starts: it truly is “next man up” in New England. Brissett wasn’t perfect, most notably throwing a would-be touchdown harder than Julian Edelman could handle. The gameplan was flawless; control the ball and not ask too much of Brissett. Again: how many teams in the league could execute a gameplan to perfection with a rookie, 3rd string quarterback? Belichick is the greatest. Not much to say about a defense that pitched a shutout. Everything looked great, and this team is as good on the defensive side of the ball as I figured they would be this year. Another huge note from this game is that special teams wins games. I’m not sure why O’Brien let Tyler Ervin return after the first fumble. He had 2 kickoff return fumbles, and fair caught a punt on the 2 yard line. It is simply impossible to play a worse game on special teams without invoking the memory of Kyle Williams in the 2012 NFC Championship game. Belichick stresses special teams, and starting 2 different drives deep inside of Texans territory was exactly the kind of boost that a team needed that was starting their third-string quarterback. You could say a lot of things about the Texans, but you absolutely cannot say they are not committed to keeping Lamar Miller involved in the offense. It sounds crazy to say this about a game where his workload was so high, but they could have gotten Miller involved even more. He is an elite talent with the ball in his hands, and I can’t help but wonder whether or not some of the checkdowns that Brock Osweiler threw to his tight ends (possibly the worst tight ends in the league) would have been better served going to Miller. That was absolutely terrible clock management by Bill O’Brien at the end of the half. Forget that the Patriots ended up taking the knee and ending the half; what exactly is the thought process here? The Patriots are trying to run the clock out and go into the half, and O’Brien starts calling timeouts. Suppose one of the runs the Patriots call ends up with a big gain and suddenly, the Patriots are in field goal range and have all 3 of their own timeouts to work with. In that scenario, O’Brien would have possibly cost his team 3 points (at least). And for what? When I watch Bill O’Brien coach, I see a coach who tries to get too cute with his play calling, trying to be a “baby Belichick”, so to speak. 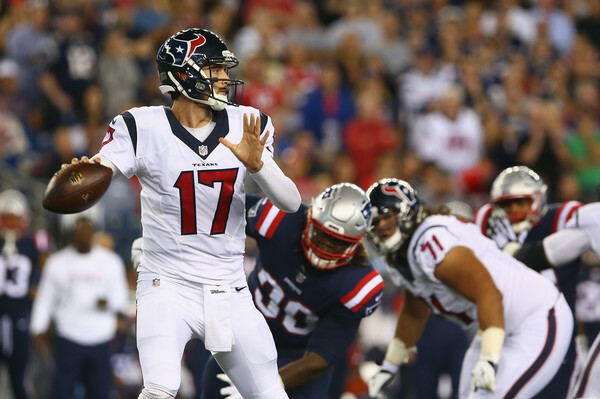 I was not impressed with Brock Osweiler at all in this game. His inability to get the ball to his receivers was on display in the first half. By the time he was able to run a play in the second half, the game was out of reach. Last week, I said that Will Fuller had appeared to put the hands issues that plagued him in college behind him. This week, he seemed to drop some catchable balls. This is a team that needs to do some real soul searching with the week and a half they have before their next game. With a dominating defense, playmakers at every skill position besides tight end, but serious consistency issues, few teams have the high ceiling and low floor of Houston. Ravens: Does any team in the NFL move the needle less than the Ravens? They are 2-0 with victories over the Bills and Browns. There will be no criticism of a team for beating a bad team in this space, though: a win is a win. I will be watching the continued resurgence of Mike Wallace. Most of the resurgence can be attributed to playing with a quarterback who can make use of his strengths again, and no one throws the deep ball like Flacco. I would look for the Jaguars to stick Prince Amukamara on Wallace, who I am not sure is fast enough to hang with him on all the vertical routs he is going to be running. I will also be looking to see whether or not someone steps up in the Ravens backfield, whether it be Justin Forsett or Terrence West. That job is there for the taking, and someone needs to show that they are going to be the guy. Jaguars: The Jaguars are a preseason darling who haven’t lived up to expectations. In particular, Allen Robinson has been very underwhelming. I am expecting that to continue in week 3, as I think the Ravens will stick above-average cornerback Jimmy Smith on him. This will, however, leave Allen Hurns to be covered by Shareece Wright, who is below-average. I will be looking for Hurns to take advantage of the opportunity. The Jaguars’ biggest offseason addition was Malik Jackson, who has been playing well. Fortunately for those of us who enjoy line play, the man tasked with blocking Jackson, Marshal Yanda, has also been playing well. Look for this to be an important matchup for the Ravens’ running game. The Jaguars have a bottom 5 rushing defense, and the Ravens have been a bottom 10 team running the ball, so I will look for the Jackson/Yanda battle to dictate the way things go on the ground. Redskins: The reports are that Kirk Cousins has lost the locker room, which is the same locker room that RG3 lost. Is the Redskins locker room the easiest locker room in the NFL to lose? How do you lose a locker room? These burning questions, along with “Will Kirk Cousins stop over and under-throwing open receivers?” will all be answered this week in East Rutherford. This Redskins team is somehow 3rd in the NFL in passing yards per game, whereas the Giants are clocking in at a respectable 13th in passing yards per game allowed. The Redskins have the 5th worst rushing attack in the league, facing a Giants team with the 4th ranked run defense in the NFL. So, I will be looking for the Redskins to get their points through the air. With DeSean Jackson seeing a steady diet of Janoris Jenkins, I expect the Redskins to continue targeting Jamison Crowder (leading the team in targets through 2 games) in the slot, probably working against Dominique Rodgers-Cromartie, who has not looked great so far this season. One matchup to keep an eye on will be Olivier Vernon vs. Trent Williams. One of the best pass-rushers in the game against one of the league’s best left tackles. Get your popcorn ready. 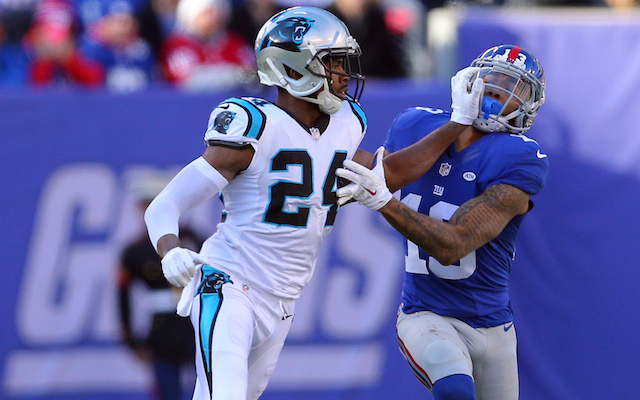 Giants: This also has to be the week that Odell Beckham, Jr. gets going, right? Wrong! I proclaimed him to be washed up after the Saints game, and I’m doubling down on that statement. The Giants have had the 11th best passing attack by yardage, but they’re completing the highest number of their passes in the league so bear with me when I say I think they’re a top-10 passing attack. They’ve also done this with minimal contribution from Odell Beckham. Translation: we don’t need you. With the return of Victor Cruz and the emergence of Sterling Shepard, the Giants have two competent wide receivers and have made Odell Beckham (the definition of a wide receiver diva) expendable. I will be paying attention to what JPP can do against right tackle Morgan Moses. After finishing last in the NFL in fingers last year, JPP looks poised to again be at the bottom of the list. However, his play has picked up immensely this season and Olivier Vernon’s presence has allowed him to go after often-overmatched right tackles. This has to be week the Giants get their ground game going, right? Through 2 games, they have the 4th worst rushing attack in the NFL. However, the Redskins have the 5th worst run D in the league, so I will be looking for Rashad Jennings to finally vindicate everyone who drafted him in their fantasy leagues. I expect the Giants ground game to finally get going here and will be looking for them to run behind Justin Pugh and Ereck Flowers, picking on Ziggy Hood (whose play has been putrid). Lions: The Packers are middle of the road against the pass, but are the league’s best run defense. This would lead me to believe that Jim Bob Cooter is going to have Stafford throwing early and often. I would also look for Golden Tate to finally have his breakout game. He has been getting a steady amount of targets, but nothing vertical. The Packers corners can be beaten, and Tate is the kind of playmaker who can take advantage of such things. With Ameer Abdullah going on the shelf with a foot injury, Theo Riddick figures to see his role in the offense increase. I will have my eyes on the interior of Detroit’s offensive line, where Laken Tomlinson will be overmatched by Green Bay’s excellent defensive tackle, Mike Daniels. Packers: The Lions feature the 19th ranked run defense and the 22nd ranked pass defense. With Jordy Nelson still getting back to game speed and presumably being covered by Darius Slay, I expect Randall Cobb to feast, particularly against slot corner Quandre Diggs. This would also be a good game for the Packers to keep Eddie Lacy, who is averaging a robust 4.3 yards per carry, involved. He is only averaging 13 (12 in one, 14 in the other) carries per game, which is simply too low for a back of Lacy’s caliber. He appears to be in better shape than last season, and should be utilized more in a Green Bay offense that seems to have lost its way. This would be as good a game as any for Lacy to score his first touchdown. The Packers should consider themselves lucky that talented Lions’ pass rusher Ezekiel Ansah is expected to miss this game with a high ankle sprain. Green Bay does have one of the better offensive lines in the league, but no Ansah will make their Sunday a lot easier. Browns: With the Browns ushering in the Cody Kessler era, the Browns have started 3 different quarterbacks in their first 3 games. If that sounds terrible, your ears do not deceive you. The Dolphins will be rolling out a defensive unit allowing the second most rushing yards per game, which would appear to mean another big game for Isaiah Crowell, who had 133 yards last week. Looking a little closer, though, 85 of Crowell’s yards came on one carry, with the running back averaging 2.8 yards on his other 17 carries. For this reason, I’m looking elsewhere for the Browns to have success. The Dolphins have the 16th ranked pass defense in the game, so there will be opportunities for Kessler to throw. He does not have upper-echelon arm strength, but was supremely accurate in college, posting a 68:12 TD:INT ratio his last two years at USC. Look for Hue Jackson to call many underneath and intermediate routes to play to Kessler’s strength. I was intrigued by the emergence of Corey Coleman, who looked like a star in the making 2 games into his career. I was prepared to ask if, when Josh Gordon returns, could the Browns be one of the worst teams in the NFL and sport one of the best receiver tandems in the league (provided Gordon looks as good as he did in the preseason)? Now, with the return of Gordon’s legal troubles and Coleman’s broken hand, it looks like yet another terrible season in Cleveland. What a weird team. Dolphins: From a team starting its third quarterback in as many games, we go to a team whose fans probably wish their team was. Seriously, is there a Dolphins fan out there who has any confidence in Ryan Tannehill? The Browns defense is pretty much average in both rushing and passing, so I would hope that if Tannehill has any shred of competency, he will move the ball. I’m going to be paying close attention (or as close of attention as I can pay to a game I don’t plan on watching one second of besides what comes up on Red Zone) to whether or not the Browns stick Joe Haden on the outside with DeVante Parker or if they have him follow Jarvis Landry around. If Haden does stay on the outside, look for Landry to have a big game, something like 10-12 catches for over a hundred yards. Vikings: This should be a good one. The loss of Adrian Peterson will obviously be the first thing everyone pays attention to on offense for the Vikings. Coach Mike Zimmer has said that Jerick McKinnon will get the first crack at the job, but with Matt Asiata also being involved in possible a 65/35 type of split. I will be shifting my gaze, however, to the continued play of Sam Bradford. The connection between him and Stefon Diggs was immediate and obvious, but I want to see what he does with Adam Thielen working out of the slot. Bradford looked his way a few times on Sunday night (5 times, to be exact) and I expect that to continue. Defensively, I expect Linval Joseph to continue wreaking havoc on the interior. Look for Xavier Rhodes to make his season debut in this game, which would do wonders for a Vikings defense that has looked like one of the league’s best. Panthers: This game will be the true test for the Panthers as to whether or not they’re a serious contender this year. After looking hapless against the Broncos and their rookie quarterback in the opener, the Panthers responded with a sound effort against an overmatched 49ers team that put a concerning amount of points on the board against what was one of the league’s best defenses in 2015. The Vikings’ Harrison Smith and Andrew Sendejo are one of the better safety combinations in the league, so look for Cam Newton to try to take advantage of man on man coverage on his giant receivers. In particular, he would be wise to pick on the ancient Terrence Newman or the returning Xavier Rhodes, or Trae Waynes (as Aaron Rodgers did last week). The Vikings corner playing the best football in this early season is Cam’s former teammate, Captain Munnerlyn, so it will be interesting to see if they bring Greg Olsen into the slot to try to play a size advantage. There is really no weak link in a pass defense that has ranked 10th in the league in passing yardage allowed per game. On the ground, Fozzy Whitaker filled in admirably for the injured Jonathan Stewart last week, but this is a Vikings team that ranks 6th in the league against the run. This will be a true test for the Panthers. In particular, I will be watching embattled right tackle Mike Remmers, who you can be sure the Vikings will be targeting with their pass rush. Bengals: With AJ Green likely to draw a heavy dose of Aqib Talib and Chris Harris, Jr. to feature primarily in the slot, I would expect the Bengals to go after a dominant Broncos pass defense by picking on Bradley Roby and a steady diet of Giovani Bernard in the passing game. My mouth is already watering thinking about the kind of physicality that the Green/Talib matchup will feature on the outside, so this is really where my eyes are going to be when the Bengals have the ball. If there is a weak part of this Denver D, it’s that they have surprisingly allowed 120 rushing yards per game. For this reason, I’m looking for Jeremy Hill to finally break out this year and have his first big game. Broncos: Much like the Bengals, I expect the Broncos to have much of their success on the ground. Cincinnati has had a stout defense in past years, but through 2 games they are allowing the most (138) rushing yards per game in the league. CJ Anderson has looked more than capable for the Broncos, so he is something to watch. 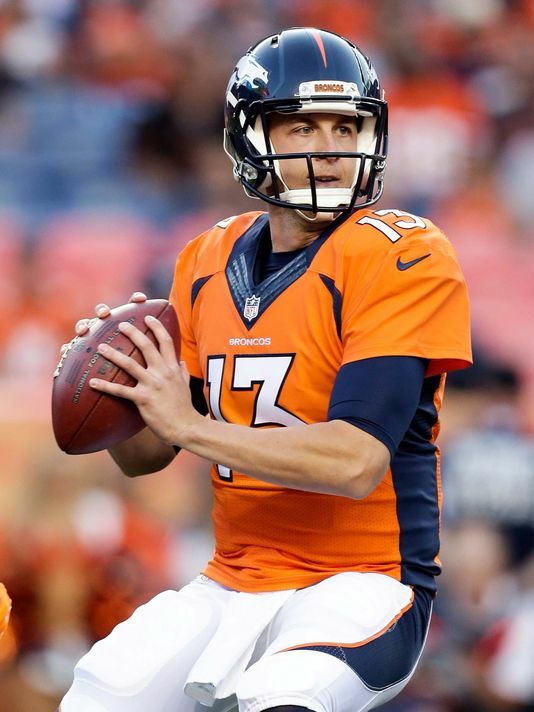 I will also be monitoring Trevor Siemian’s progress. The Bengals are allowing a league-low 52.8% completion percentage, and are top 10 (219) in terms of passing yards per game allowed. Granted, that is influenced by the torrential downpour they played in last week against the Steelers, but this will be another tough matchup for Siemian. Cardinals: We cannot hold a loss to the greatest coach and team in the history of professional football in week 1 against the Cardinals. Last week, they looked every bit the NFC-favorite that many have pegged them as. This week, they travel to the toilet bowl that is being affectionately called “The Cap” by depressed Western New Yorkers. If there’s one thing I’ve learned from growing up in Rochester, it’s that the Bills routinely drag teams down to their level at home. I don’t expect that to be the case, this week. What I’m going to be paying the most attention to is how Bruce Arians schemes his receivers open and what moves Rex Ryan counters with. Will Larry Fitzgerald line up in the slot as he has been? Does that mean Rex will bring Darby or Gilmore inside to man up in the slot, or will Rex keep Robey-Coleman on an island against the future hall of famer? Consequently, who is going to cover John Brown? I personally will look for Brown to finally shake off the effects of his preseason concussion and break out in a big way against a Bills secondary that simply doesn’t have the speed to stay with him down the field on every deep shot the Cardinals are going to take. The Bills appear to have a league-average rushing defense in terms of yards per game, but they were also gashed repeatedly by the player whose skill set best compares to David Johnson last week in Matt Forte. I’m sorry, Bills fans, but this game could get ugly in a hurry (I’m not really sorry). Bills: Well, a week has passed and the Bills’ firing of Greg Roman doesn’t look any better, smarter or more like the solution to their problems. Problems, by the way, that I expect to continue this week against the Cardinals. This Bills defense is bottom-10 in the NFL in terms of yards per game, and the Cardinals passing attack is top-10 in yards per game. In other words, this is a matchup from hell for an overmatched and undermanned Bills defense. The Cardinals pass defense is middle-of-the-road this year, but the Bills are 30th ranked in passing yards per game, so it would appear to be unrealistic to expect the Bills to capitalize on the only “weakness” of this Cardinals D. With a new voice calling the plays in Buffalo, it is tough to say for sure what the gameplan will be, but I would expect them to try a few shots down the field and try to make a few things happen with some big plays. The silver lining to this game for Bills fans should be that if there is a second straight loss, this time in a way that implies the players may have given up on their coach, Rex’s seat may heat up in a hurry. Raiders: Many (myself included) thought that the Raiders defense would be among the most improved units in the league after all the money they spent in free agency. 2 games in, they rank as the worst defense in the NFL. Playing the Saints and Falcons can make any defense look suspect, so look for this game to be the game that the Raiders get right on D. David Amerson is this team’s best cornerback, and it is encouraging for the Raiders that he is expected to play after sustaining a concussion last week. The Titans are average against both the run and the pass, so look for the Raiders to come out with their normal gameplan of steady downfield throws to Amari Cooper and Michael Crabtree, in particular whoever is being covered by Perrish Cox. The Raiders boast one of the 2 or 3 best offensive lines in football, but right guard Gabe Johnson has had a rough first two games. He needs to get right in a hurry against one of the most disruptive and underappreciated interior defensive linemen in the league in the Titans Jurrell Casey. That is the matchup I will be paying the most attention to along the line. Titans: Who are the Titans? A loss against what looks to be one of the best defenses in the NFL in week 1 followed by a win against a team that some thought could contend for a wild card spot in week 2 has me confused as to who the Titans really are. In terms of offensive yardage per game, this team is average in terms of rushing and slightly below average throwing the ball. I expect them to look to the air to take advantage of what has been the league’s worst pass defense by a mile this week. In particular, I expect Delanie Walker to have a big game exploiting a linebacking crew that I don’t trust much to be able to hold up in coverage against a player of his caliber. I also will be looking for Marcus Mariota to pick on Sean Smith, who is still adjusting to Jack Del Rio’s scheme in Oakland. DeMarco Murray has been running fairly effectively for the Titans, so I am very curious as to whether or not they will stick with the ground and pound game plan they talked about during the offseason or if they will take to the sky to try to exploit the 32nd-ranked pass defense. Taylor Lewan is finally starting to show the promise that led to his being a first round pick and what better test of his skill than trying to block all-world pass rusher Khalil Mack? I will be watching that matchup closely. Rams: True fact: The Los Angeles Rams have not scored a touchdown since 1994! This week is probably as good a week as any for that to change. The Bucs have a top-10 rushing defense and a bottom-10 passing defense, so it would seem like a pretty cut and dry gameplan for the Rams on offense. Case Keenum has been downright bad, but there is an opportunity for him to get something going with Tavon Austin this week, provided he doesn’t see much of Alterraun Verner. Tampa Bay has possibly the league’s worst left guard and tackle combination in Donovan Smith and Kevin Pamphile, which is bad news because, as you may have heard, the Rams have one of the best defensive lines in the NFL. 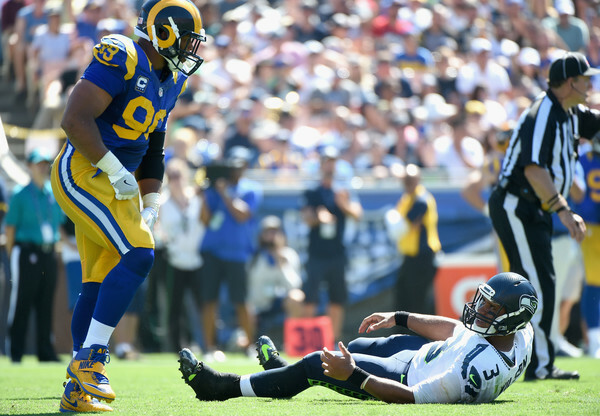 Expect those two to see a healthy dose of Robert Quinn and Aaron Donald, who is a destroyer of worlds. This game is going to be ugly, but if you like watching dominating pass rushers pin their ears back and go after a quarterback, you can find something to enjoy here. Buccaneers: The first thing you need to know about this game is that I’m expecting a monstrous game out of Mike Evans. The Rams have possibly the worst cornerback duo in football, and Coty Sensabaugh looks to be the man tasked with guarding the 6’5 Evans. Doug Martin is out, meaning Charles Sims will be the feature back. I really don’t expect the Tampa Bay running game to be much of a factor, though. This should be a game dominated by Mike Evans. One spot to pay attention to will be whether or not the left side of the Bucs’ line can hold up against Quinn and Donald. If the answer is no, expect another mess of a game like last week’s Seattle/Los Angeles game. 49ers: The Seahawks have the 3rd ranked run defense and 4th ranked pass defense in the NFL. So where, exactly, does this 49ers team attack them? I really don’t know. The 49ers have some of the worst skill position players in the game, and this is a terrible matchup for them. They could possibly try to get lucky on a bomb to Torrey Smith, but that’s really their best shot of creating offense, unless they get a few turnovers and have short fields to work with. Seahawks: The Seahawks will be facing the 24th ranked run defense, and the 12th ranked pass defense, so it looks like the ground game could be the way to go against San Francisco. With Russell Wilson still undoubtedly feeling the high ankle sprain he suffered in week 1 and Thomas Rawls dealing with a leg injury, Christine Michael appears to be the running back in line to do the bulk of the damage. It bears mentioning that the 49ers surprising rank against the pass is due to them playing the Rams in week 1, who are pathetic. Normally I would expect Russell Wilson to take some deep shots down the field and get Doug Baldwin his typical workload, but I think the combination of Wilson’s injury and a poor run defense will be enough for the Seahawks to keep it on the ground for most of the afternoon against the 49ers. Steelers: The most important thing to watch for in this game is going to be how the Steelers get Antonio Brown involved. Brown had a big drop last week; Ben Roethlisberger also missed him on a few big throws, one of which probably would have been a touchdown. The Steelers feed Brown and I’m expecting this to be a shootout. The Eagles have a top-5 pass defense and a top-10 run D in terms of yardage allowed, but they haven’t played an offense like the Steelers yet in this young season. The playmakers the Steelers have on the offensive side of the ball will be the best test for Jim Schwartz’s unit yet this year. I will also be paying attention to how the Steelers choose to go after Carson Wentz. The Eagles have let Wentz go down twice in each of their games, which means that there are opportunities for him to be pressured successfully. Eagles: If you read my recap of the Eagles/Bears MNF game, you know that I am high on Carson Wentz. The Steelers boast the second ranked rushing defense, but they have the second worst passing defense. With that being said, I expect the Eagles to go after rookie Artie Burns, who has made some big plays but has also looked lost on plays, early and often. I expect Jordan Matthews to be a big part of their passing attack in this game. On defense, I will be paying close attention to the Fletcher Cox/Maurkice Pouncey matchup on the interior. Pouncey has looked like he is still getting up to NFL speed coming off a year lost to injury. Cox, meanwhile, is one of the best defenders in football; a truly disruptive force along the defensive line. In the words of Bart Scott, can’t wait! Jets: The Jets are 1-1, but they could easily be 2-0 and I see them as a good football team. Brandon Marshall will be seeing a lot of Marcus Peters all afternoon, so I would think Ryan Fitzpatrick will look elsewhere to move the football. I will be paying attention the emergent Quincy Enunwa, yet another towering wide receiver on the Jets’ roster. I am curious to see if Enunwa can build on his big performance from last week and start stringing together the kind of games that would signify a young player taking the next step. Eric Decker will be matched up with Phillip Gaines, which is an opportunity that I expect Fitzpatrick to take advantage of early and often. The Chiefs’ normally fierce defense has taken a step backward this year, and have the 3rd worst rush defense in the league. It will be interesting to see whether or not the Jets lean on Matt Forte, who is looking rejuvenated in Chan Gailey’s offense. I will have my eye on Ryan Clady, who has not looked very good this season so far. He will have his hands full with Tamba Hali and whether or not he can keep him off of Fitzpatrick will be crucial to the Jets’ passing game. Another line matchup to pay attention to will be Dontari Poe against potential Hall of Fame candidate Nick Mangold. Chiefs: The Chiefs will be facing the 5th best rushing defense and the 7th worst passing defense in the Jets, so I expect Andy Reid to take advantage of that disparity. Possibly the main reason for the Jets’ surprisingly bad pass defense is the complete no-show by Darrelle Revis this year. Rumors have circulated about conditioning issues, but the combination of age and having a major knee injury in his past may have cost Revis a step or two now that he is on the wrong side of 30. Expect Alex Smith to target Revis early and often, especially if he is covering Jeremy Maclin. It will be interesting to see what Jamaal Charles’s role is in the offense in his first game back from last season’s knee injury. I expect to see something resembling a 60/40 split with Spencer Ware in favor of Charles if he is good to go. One major opportunity for the Chiefs will be to get Travis Kelce involved in the passing game. Kelce is one of the game’s best tight ends, and it has long been my opinion that the Chiefs do not throw to him enough. These Chiefs are a far cry from the Kansas City teams I grew up watching force the ball to Tony Gonzalez, but Kelce is a weapon with a similar skill set and should be a much bigger part of the passing game. There are few players in the NFL who can cover Kelce one on one, and none of them play for the Jets. 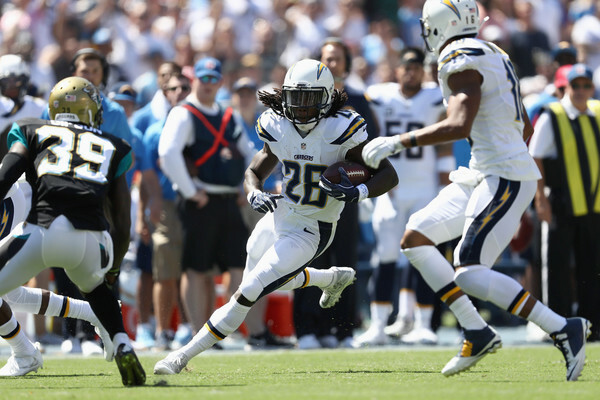 Chargers: The Chargers are off to one of the least-lucky starts in recent memory. In week 1, they lose their number 1 wide receiver, Keenan Allen, to a torn ACL. Last week, they lost Danny Woodhead to the same injury. Luckily for them, the Colts feature the 25th ranked pass defense and the 29th ranked rushing defense. The Colts’ secondary has been absolutely ravaged by injuries, which leaves plenty of opportunities for Phil Rivers. I liked the rapport he showed last week with new wideout Travis Benjamin, and I expect that to continue this week. Melvin Gordon should also benefit twofold from his increased share of the backfield and the Colts’ awful defense. This should be a good game for the Chargers’ offense for pretty much all of their skill position players. I will be paying attention to whether or not Antonio Gates becomes a bigger role in the offense than he has been the last two weeks. Colts: As previously mentioned, the Colts’ defense was not very good to start this season and has been decimated by injuries in the secondary. The Chargers have the 7th worst rushing defense in the NFL and the 4th worst, so the Colts are in the same boat as the Chargers in terms of having a very appetizing matchup. With Donte Moncrief out, Phillip Dorsett is primed to see an increased role in the offense, but he will be facing either Brandon Flowers on the outside or Casey Hayward on the inside, neither of whom would be a favorable matchup. Dorsett does have speed on his side, and Luck has the arm to get it to him wherever he goes on the field. T.Y. Hilton will see a lot of Jason Verrett, but he also has top flight speed and has shown an ability to get open throughout his career. These cornerback/receiver matchups are going to be the most exciting of the game, and are worth your attention. A line battle of note will be how Anthony Castonzo handles Melvin Ingram, who could make Andrew Luck’s day rough in a hurry. Bears: Jay Cutler is expected to miss time with his thumb injury, but that may not be the worst thing for these Bears. Through two games, Cutler has looked ineffective and as apathetic as ever. The Cowboys’ defense has been pretty much average against the run and the pass, so there will be opportunities to score. I would expect Brandon Carr to take Alshon Jeffery, but if Jeffery ends up with Morris Claiborne, there will be opportunity for him. Claiborne has actually had a decent year so far, but he would be overmatched against a player like Jeffery. This could be the game that Kevin White makes some progress towards the breakout year many thought he would be having. It is interesting to note that White still doesn’t have a full grasp of the playbook, often times looking lost on the field. You may hear announcers or analysts mention that White did not run a full “NFL route tree” at West Virginia, and while that may be true, is that really a valid excuse? This is White’s second year with the Bears (he did not play his rookie year due to a leg injury) and he still doesn’t seem to know all of their plays. I’ve remarked to my friends before that certain players love football and other players simply play football. I think of a guy like Brett Favre or Jerry Rice, or J.J. Watt if you want to use a more modern comparison, and I remember a player who you couldn’t keep off the field with a crowbar. When one of those guys got their playbook, they didn’t put it down until they knew it by memory. Time could prove me wrong, but I find it to be a major red flag that a player with White’s physical gifts doesn’t seem to have the mental drive to be great that some of his peers possess. Speaking of underwhelming players, Bears’ running back Jeremy Langford is one of the players who moves the needle the least that I’ve watched in the NFL this year. Langford has a career average of 3.5 yards per carry, and it’s down to an even 3.0 this year. Simply put, he is not an NFL-caliber starting running back, and I do not expect him to take advantage of playing a Cowboys defense that other players might be able to have a nice game against. I will be interested to see what John Fox does to try to create pressure against a rookie quarterback playing behind one of the best offensive lines in football. Typically, with a team like Chicago that doesn’t feature any standout pass rushers, I would expect pressure to come from blitzing, so I’ll be looking for that in this game. Cowboys: The Bears have the 6th best pass defense in the NFL, but are the 11th worst rushing defense. 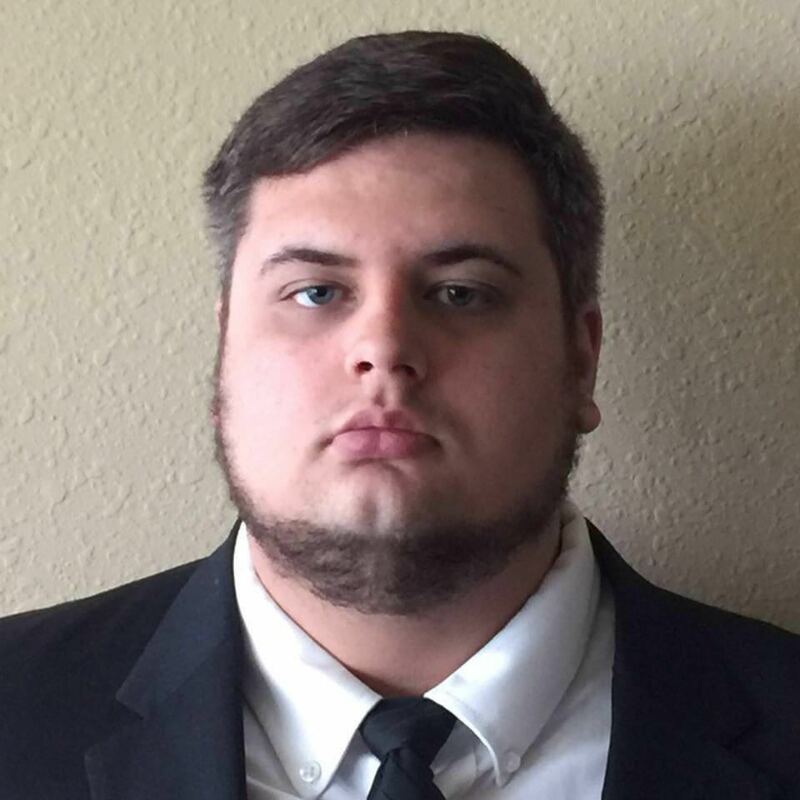 You may have heard that the Cowboys have an excellent offensive line and a reputation for being able to run the football. This season, Ezekiel Elliott has not lived up to the 4th overall pick the Cowboys used on him. Given Dallas’s conservative game plan so far with Dak Prescott, I would think this would be the game that Elliott finally shows off that talent he had on display at Ohio State. If they are so inclined to take a few shots down the field, Dez Bryant would look to have a plus matchup against either Bears cornerback. Jacoby Glenn has actually played pretty well this year, but Tracy Porter is on the wrong side of 30 and matching up with a receiver with Bryant’s physicality might be too much to ask of him. Dallas is another team that doesn’t feature much pass rushing talent that jumps off the page, particularly with their two best rushers lost to suspensions. I will be looking for them to try to dial up pressure against Hoyer with blitzes, and lots of them. Falcons: The Falcons certainly looked great against the Raiders last week. The Saints have the 10th worst rushing defense in the league and the 3rd worst passing defense, so last week’s game could be expected to be a reasonable facsimile of what Monday night’s game will look like. Julio Jones is definitely still being bothered by a leg injury, but he is still an all-world talent and I expect him to go over a hundred yards for the second straight game. With Delvin Breaux out for the Saints, there is no one at cornerback that can hang with Julio, so 200 yards is in play. Mohamed Sanu also could have a good day because, again, the Saints’ cornerbacks are pretty much replacement-level talent. I will be watching to see if Jacob Tamme continues to be a major part of the offense. Another thing worth monitoring is what the timeshare in the backfield looks like for the Falcons. Through 2 games, Tevin Coleman has looked more explosive than Devonta Freeman, who secretly rode a great first half of last season to withstand a so-so second half to create a season that probably overstated his skill level. I would expect this game to be at least 50/50, and if there is a majority, Coleman should be the one to get it. Saints: It’s funny that the Seahawks not only traded their center, Max Unger (who is the best lineman on the Saints), but also a first round pick for Jimmy Graham, right? I find this funny. The Saints have gotten very competent play from their offensive line, which bodes well for another big game for Drew Brees. You know what else bodes well for Brees? This game is being played in New Orleans, where he has a much easier time running their offense. The Falcons also have the 11th worst passing defense in the NFL, which should be good for Brandin Cooks and company. Desmond Trufant has been one of the best cornerbacks in the league for one of the past few seasons, but he has not played up to his standard level this year. If he follows Cooks around for this game, Willie Snead could be in line for a big game. I expect both receivers to have reasonable success against this Falcons defense. The Falcons also have the 6th worst rushing defense in the NFL, so there should be running lanes for Mark Ingram, who has quietly turned into one of the more well-rounded running backs in the NFL. The Saints are currently 28th in the league in rushing offense, but this could be the game that they climb that list. From a defensive standpoint for the Saints, Chris Chester is the weak link on the Falcons’ offensive line, so if Nick Fairley can handle him one on one, blitzing behind him could be a strategy for Dan Quinn to utilize in order to create some pressure on Matt Ryan. This entry was posted in billannechino, NFL and tagged Buffalo Bills, football, Houston Texans, New England Patriots, new york giants, nfl, week 3 preview. Bookmark the permalink.